You are currently browsing the tag archive for the ‘Casablanca’ tag. Of course this isn’t just the Arab world. We lived in the town of Chambery, France, for a year. Chambery is located so close to the border of Italy that it was at one point part of Italy, and the last king and queen of Italy are buried by the shores of a lake not too far away. I figured when we went to Italy, my French would work better than my English, but I was wrong. Also in Spain, English will get you further than French or Arabic will. 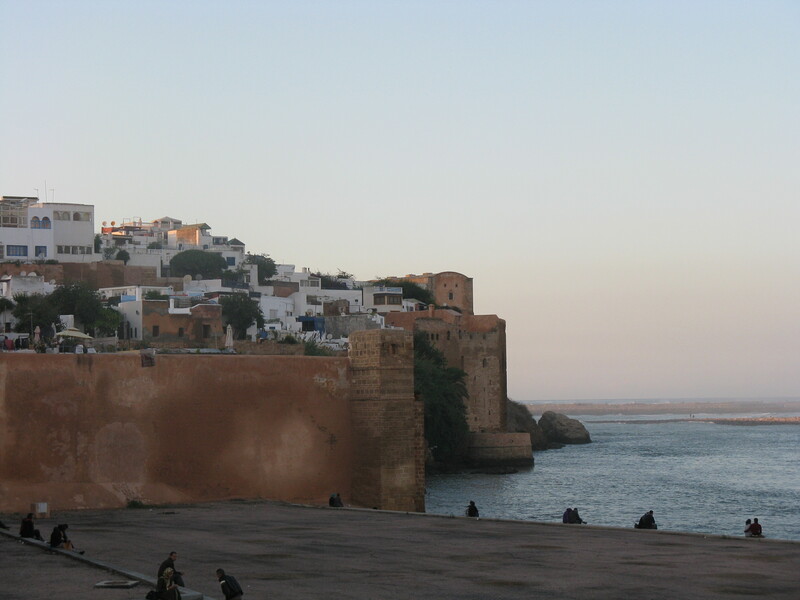 But today, our topic is Morocco. 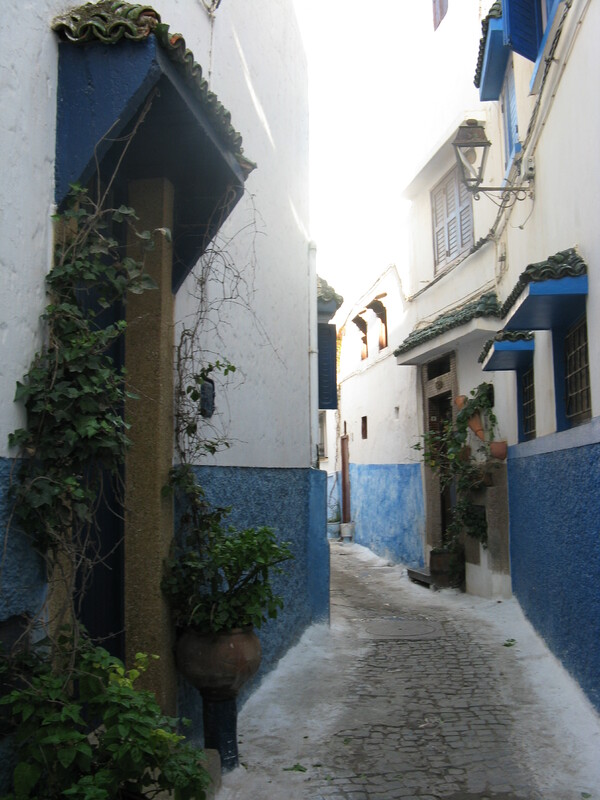 I loved living in Morocco, and I cried like a baby, only more bitterly, when we had to leave. But living anyplace is…well, just life. There are bills, and you have to go to work, and kids have problems at school, and housing is hard impossible to find, and sometimes the taxi drivers are surly and you get a cold and it’s so damp that your books mould. 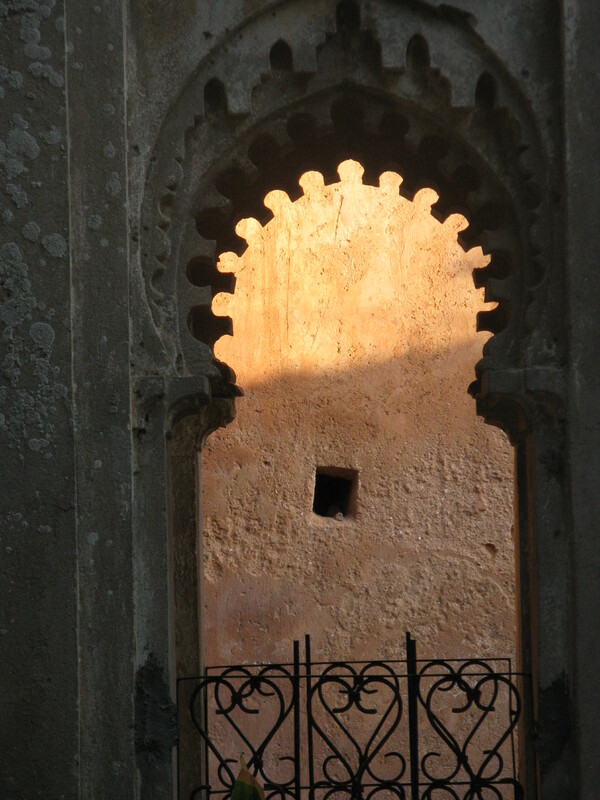 Visiting Morocco, however, is just wonderful, plain and simple. 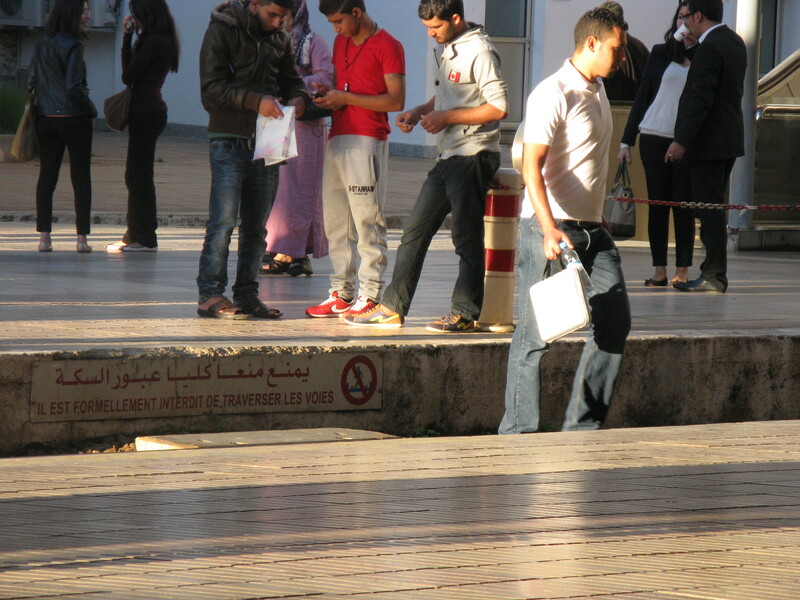 We spent a lot of our time in Morocco playing tourist. Oh sure we visited people, and it was wonderful to see them. We had lunch with old colleagues and ate chicken and olive tagines for about $4 in a basic area of the city, and we met a friend for ice-cream in the expensive European part of the city and it costs $7 for 3 little boules (scoops), but mostly we just wandered around happily. I got a pedicure. I love getting pedicures but I never do, as they are expensive. In Rabat, you can go to the European section and visit a spa and still pay $12 for a very nice, very long pedicure. My nails are still a delightful red, although of course now I’m wearing socks and no one can see them. But I know they’re there. No you don’t want a pic of my toes. You want cool arches! 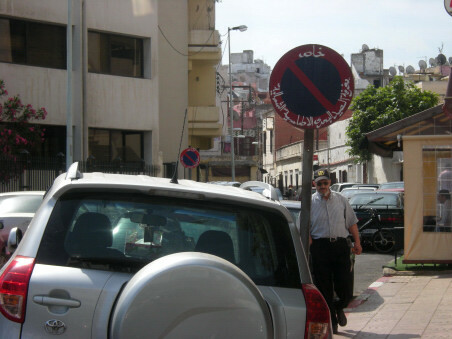 We took a lot of taxis and it was fun to watch Donn plunge right back into Darija, chatting away to the taxi drivers, who are always impressed and happy if you speak even a smattering of Arabic with them. When we lived there, I made friends with an Italian woman with a Moroccan husband, whose daughter was in Ilsa’s class at school. Irina’s dream was to open a small store selling organic produce and her own home-made jams, jellies, and sauces. She was an incredible cook. We’d lost touch, and I wanted to find her. We walked to her old home and rang the bell several times. No one was home. A Moroccan man came up to see what we wanted. “The Italian woman?” we asked. He shook his head, but went to talk to someone else who was coming up to see what we wanted. (This is common.) Oh yes, he knew her, and pointed to a house across the street. 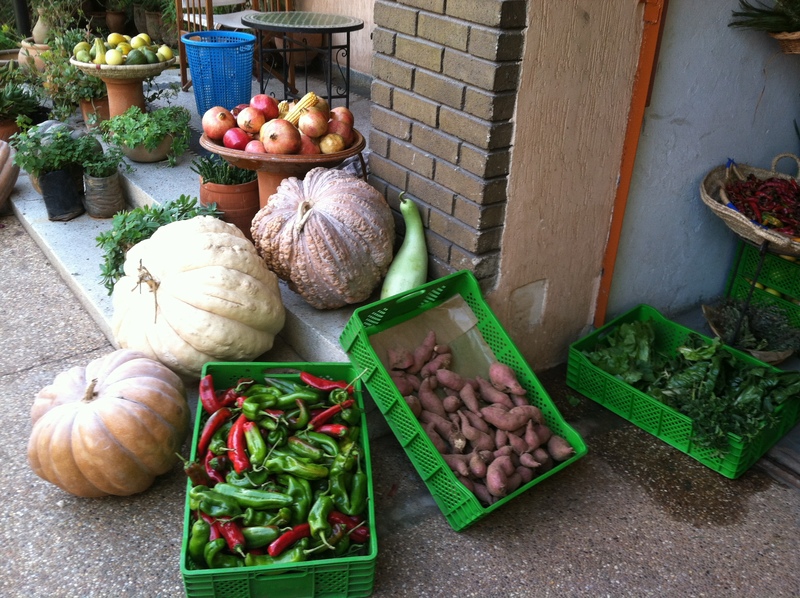 When we pushed open the door, we saw mounds of gourds, enormous pumpkins and squashes, piles of pomegranates and peppers, and more. The small garage was filled with parsley, lettuce and other greens, and behind a table with a cash register on it was a shelf groaning with jars of jellies and sauces, all prettily labeled in Irina’s own hand. And there was Irina herself, in a white coat, chatting with a French woman who had obviously just come to pick up her order, and was loading it all into an enormous straw basket. This would prove to be a theme of our trip–finding people with whom we’d lost contact, and finding them doing really well, succeeding at what they’d hoped to do. I was thrilled to see Irina, and to see how busy she was. She had people stopping by nonstop to pick up their orders. She asked us to come back on Monday afternoon for coffee, which we did, and had a great time catching up on the news. I took her card and gave it to all my friends, hoping to drum up even more business for her. I hope next time we go, she has her own shop. So. 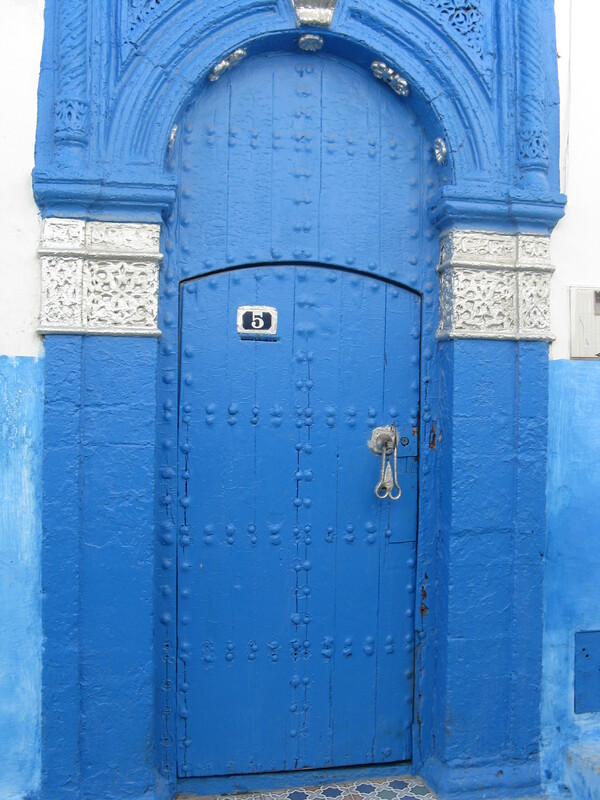 Our first day in Morocco, we walked by the kids’ old school and took pictures, visited Irina, and went downtown and wandered round the Oudayas until sunset, at which point we went back to our friends’ house, where we spent a thoroughly delightful evening eating and talking till late. Sunday we went to church with them, where we saw many old friends and attempted to cram 3 years into 10 minutes. Then we had lunch with former colleagues. Then we had expensive ice-cream with a Moroccan friend, then another late evening just talking with our hosts. We sat round a table in their garden, staring out at trees and sometimes with a fire warming our backs from the small fireplace on the patio, ate good food, drank good wine, and shared good conversation. Life doesn’t get much better than that, right? 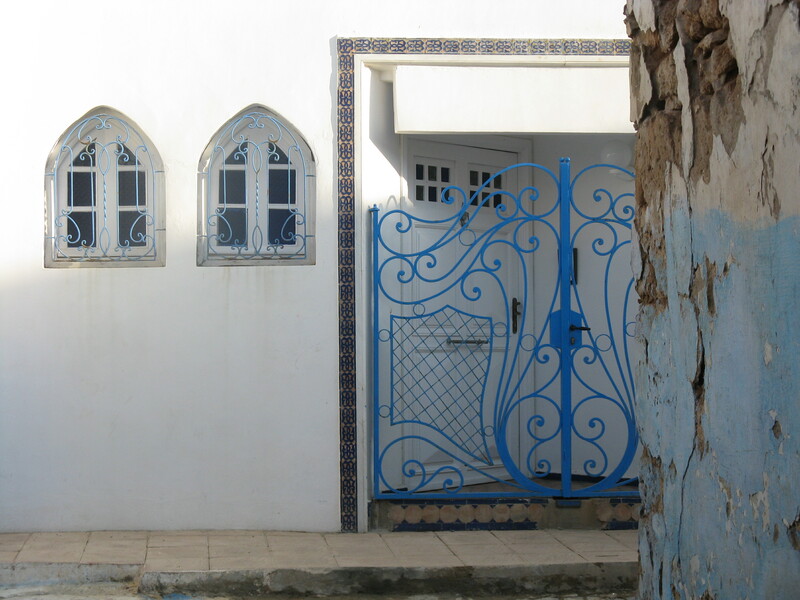 Door in Oudayas, where most everything is blue and white except for the cats and the bougainvillea. Isn’t THAT an exciting title? I knew you’d be impressed. So we set off from our Portland home on Oct. 24th. 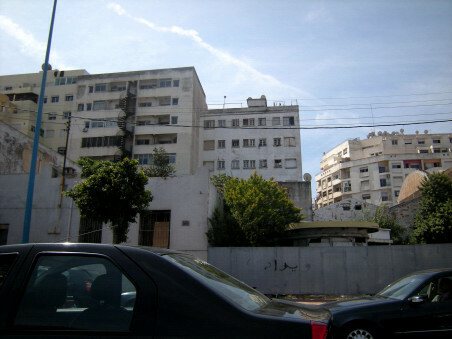 Our flight was nonstop to Amsterdam, then we had an hour and a half layover and then another non-stop to Casablanca, where we planned to take the train to Rabat, our former home. And already, when you read the words “we planned,” your heart did a double-thump because you knew the best laid plans of international travelers gang aft agley. Actually it really wasn’t too bad. The flight from PDX was 15 minutes late or as we call it “totally on time, dude” and we landed just fine in Amsterdam some 10 or 11 hours later, having learned that the new comedies are so stupid one can’t sit through the whole thing, and having read the entire new Bridget Jones book and a lot of classic Sherlock Holmes in which I pictured Holmes and Watson as Cumberbatch and Freeman, which was actually kind of fun. Try it on your next long trip. Finally, about 30 minutes after the flight was to have left, we reached the front. They scanned Donn’s boarding pass and got an ominous beep. We smiled feebly at the impatient passengers behind us while the flight attendants peered anxiously at a computer. 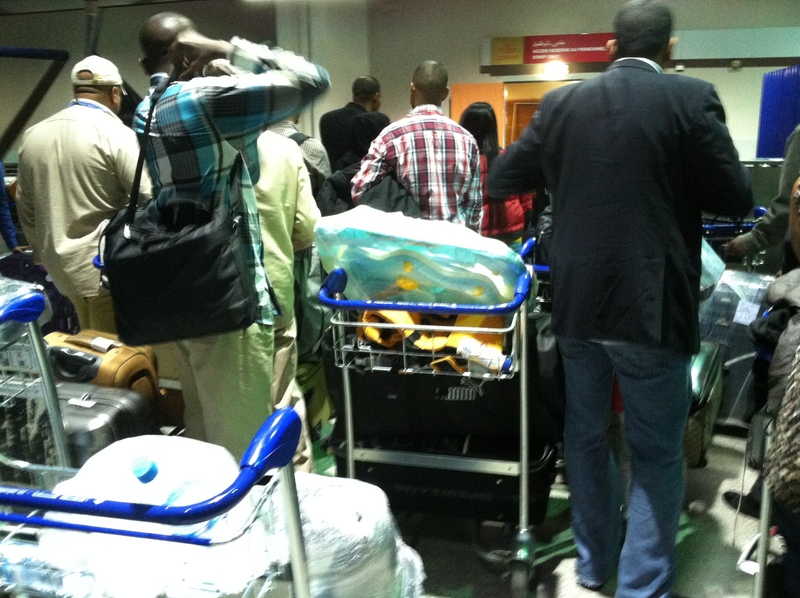 “Your bags didn’t make it so you can’t board for security reasons,” they announced. This does not make sense. If you have a bomb in your bags then you would want your bags on board, not you. Right? We have told this story to many people and they have all agreed–this was something new, thought up by KLM and illogical to mere mortals. start it at about the 2 minute mark. The accent was the same, but they were going on and on about Prague and King Wenceslas Square and darling, the crowds! and they didn’t once mention Watney’s Red Barrel. 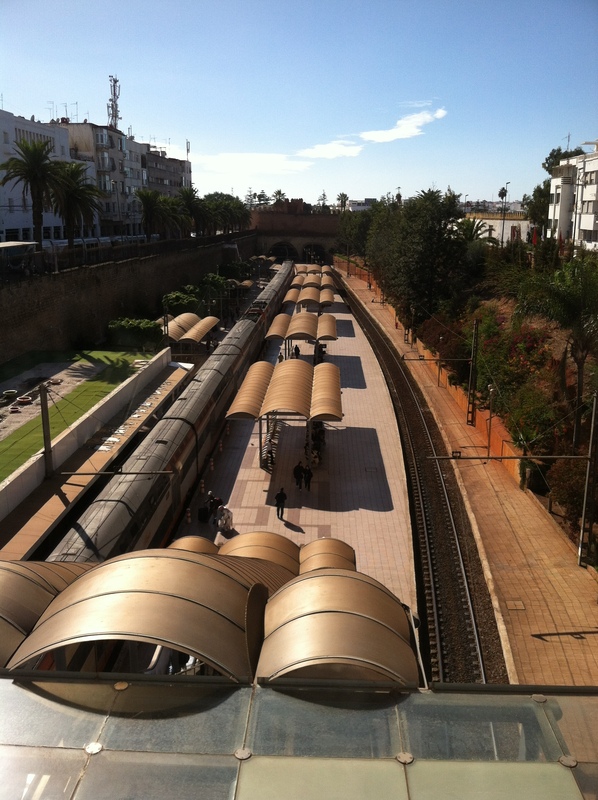 Eventually we made it to Casa, landing about 9:15 which just gave us time to rush through the airport, change money, collect our bags, buy our tickets, and make the 10:00 train to Rabat. We got to our friends’ house after midnight, having been unable to phone and tell them we’d be 9 hours late. It didn’t matter. In the morning I opened the shutters and looked out on white walls, bougainvillea in magenta and scarlet, spiky palm trees, and a blue sky, and felt I’d come home again. Time passes, the world revolves around the sun, and things expire and must be renewed. Reflecting on this one day, as is our wont, we realized that we needed to renew our passports this year—at least, the kids and I do. 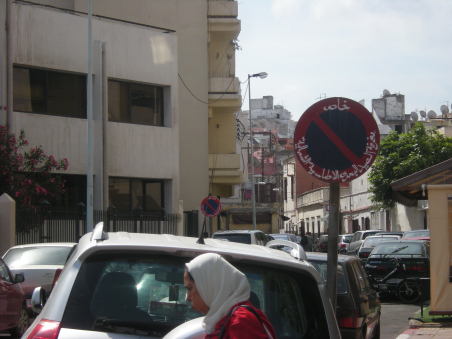 In Morocco, an American citizen can only renew her (or his) passport in Casablanca. 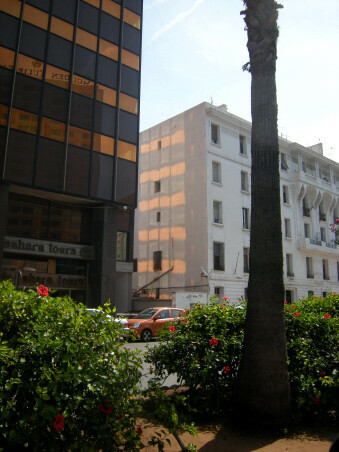 Although the embassy is conveniently located right here in Rabat, citizen services are in Casa. In their continuing efforts to provide US citizens with the very best customer service on the planet, it is open from 8:30-9:30 and then again from 1:30 to 3:00. It’s closed on Fridays and weekends, and takes all holidays off—both American and Moroccan. It’s located right downtown in a busy part of a crowded city—in other words, parking is a nightmare. In spite of knowing all these things, we decided to drive down instead of taking the train. The kids all had Wednesday off school, and since they had to physically be there, we decided Wednesday morning was the perfect time to do this. They disagreed, feeling rather strongly that a day off school should, in a just and fair universe, equal a day to sleep in. Ilsa in particular was rather vocal and nasal about it. Poor child; she has many grievances. It comes with being 13. So today we got up at the crack of dawn—literally, with me standing on the balcony eyeing the pale pink sky and the swifts, waking up with us and already wheeling and turning amongst the thin clouds. We brought a lot of books into the car and drove off to Casa, fearing the morning commute traffic, but finding it not bad. We drove on and on, not recognizing anything from the map. Unfortunately (cough! ), we’d left a bit late, and the clock was getting closer and closer to 8:30. “At least your make-up looks lovely,” said my husband snidely. The road came to an end at an enormous, clogged roundabout. Unsure, we headed off to the right. The new road dead-ended so we randomly turned left. We’ve both been in Casa several times so things often looked tantalizingly familiar, but they weren’t actually. The road ended again and we randomly turned right—I thought I might have spotted the famous mosque which was in the same general area as the consulate. We got tangled in traffic again. The clock was approaching 9:00. We pulled into a gas station to show the attendants our maps. All the attendants gathered round. Soon our maps were being passed hand to hand, as about 9 men crowded round and discussed it in rapid Arabic. I’m not sure, but I think they were discussing how to read the map, if they recognized anything on the map, and who among them spoke French and could explain it to us. Finally an older man, someone who didn’t actually work at the gas station, came up to us and gave us directions. Success! We finally found the consulate. No roads were marked, so we had to ask 2 other people (a woman selling newspapers and a guy on a scooter) for street names. It took us a long time to get there. By this time, it was 9:10. We drove around and around the area, looking in vain for a parking spot, but there was no spot to be found. Each giant circle, thanks to traffic, took 10 minutes. Finally we found a spot. “It’s too small,” said Donn. “If anyone can do it, you can,” I said heart-warmingly. And I was right! He parallel-parked us in a teeny-tiny spot without even bumping the other two cars. It was 9:29. We ran the four blocks to the consulate, which is surrounded by enormous blocks of concrete planted with flowers, a mixed message at best. There were lots of guards. The first lot sent us to the second lot, who pointed us across the street to a third. The third guy looked at his watch as we panted up, then at our navy blue passports. “It’s 9:30,” he said accusingly. “Please,” we said. “Parking,” we said, gesturing. “Go!” he told us, speaking into his walkie talkie. So back across the street we went, past the second lot again, and into the consulate itself. We were told to cut an entire line of non-Americans, which felt sort of rude and sort of fun! 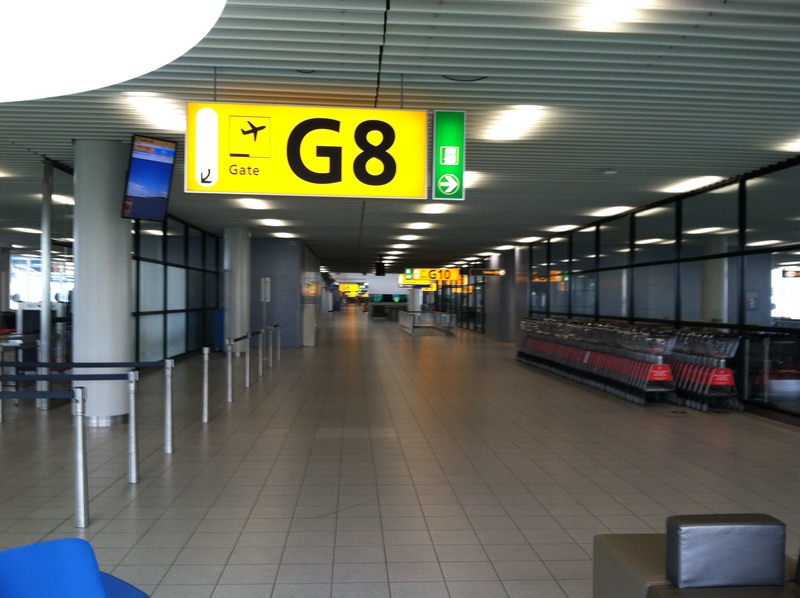 We went happily through security (Donn: Ilsa, why on earth did you bring a whole backpack? Ilsa: It has my books in it. Donn: sigh…) and then submitted all our forms successfully, even though we’d forgotten to measure the twins and had to guess at their actual height. Then we had second breakfasts at a little café, and had another, more relaxed, traffic adventure that included someone driving a fork-lift blindly into incoming traffic, as we searched unsuccessfully for the auto-route to bring us home. And, since it seems every time I mention going to Casa people sigh enthusiastically at how exotic and exciting it all is, I tried to get some snaps of the real Casa, which is crowded, polluted, noisy, and industrial. 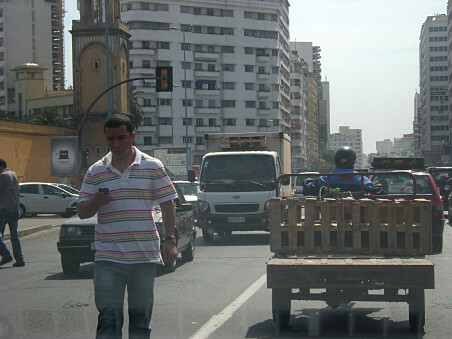 Oh and the traffic is worse than Rabat! Yes I did take that from the car window at a red light. How could you tell? But then I remembered visiting Turin, in Italy. Everyone said it was a horrible industrial city, but we just wandered around the downtown area, totally entranced. We loved it. So maybe there are those who love Casa too. But…which part is enticing and exotic? Yep, through the windshield. You guys are good! Typical Casa. I didn’t even take pictures of the industrial area. 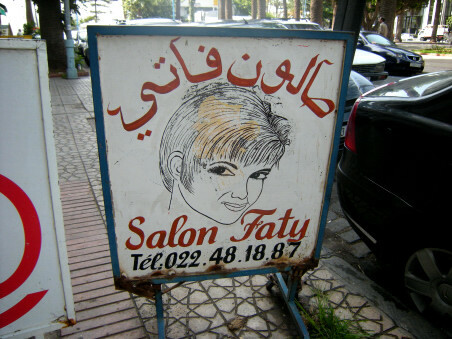 Still, if you ever are in Casablanca, perhaps at the US Consulate, and you need to have your hair done, you can always go with the interestingly-named option. PS from my last post: The “balle” isn’t until the end of school, and all his friends are either going to be out of town or already have dates! I’m still working on him.